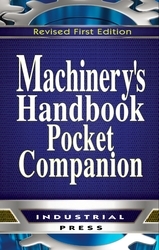 Machinery’s Handbook Pocket Companion is designed for anyone in the machine trades for whom convenient access to just the most basic data is at a premium. Extremely concise yet authoritative, this invaluable tool draws on the wealth of tables, charts, and text in the Machinery’s Handbook, 30th Edition. Much of the subject matter is reorganized, distilled, or simplified to enhance this book’s usability and to keep its bulk down. Both practitioners and students will find the Pocket Companion to be a convenient ready-reference to keep nearby while working on the shop or factory floor or learning the fundamentals in the school lab. Serves as a handy and portable complement to the vastly larger compilation of data, standards, and text, in the Machinery’s Handbook, 30th Edition. The visual design and carefully organized presentation of fundamental and reliable data facilitates frequent and easy use, helping to save time and labor. This first revised edition includes over 300 refined and redrawn illustrations. While it serves as a complementary text, this book does not replace the Handbook. Click here to go to the Machinery's Handbook, 30th Edition.